As globalization has spread, along with chain hotel logos, there’s often a sense of sameness from place to place. Thankfully some designers aren’t content with that too-frequent letdown and decide to do something unique. My most recent find in that regard is the quirky and well-thought-out El Mercado Tunqui Hotel in the historic city of Cusco, Peru. 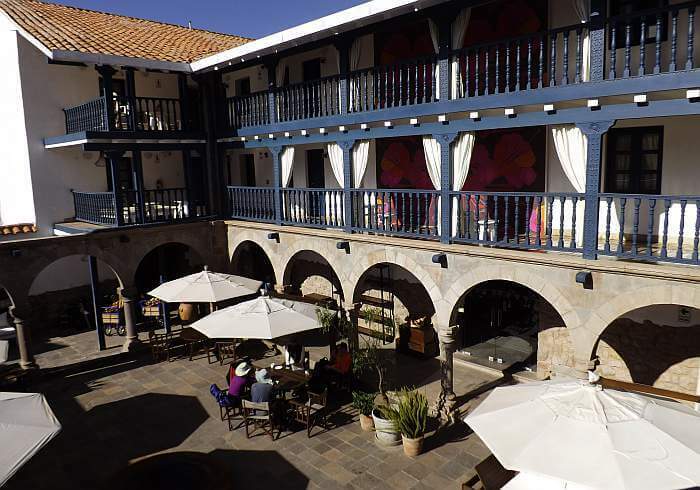 There are plenty of great hotels in Cusco, of course, many of the best in spaces that were once convents, monasteries, or the home of a conquistador. El Mercado Tunqui is a new building, but on land where a local market once stood. So it takes its cues from colonial architecture, with a large courtyard and balcony hallways, but it goes beyond that by creating a market feel to go along with the name. 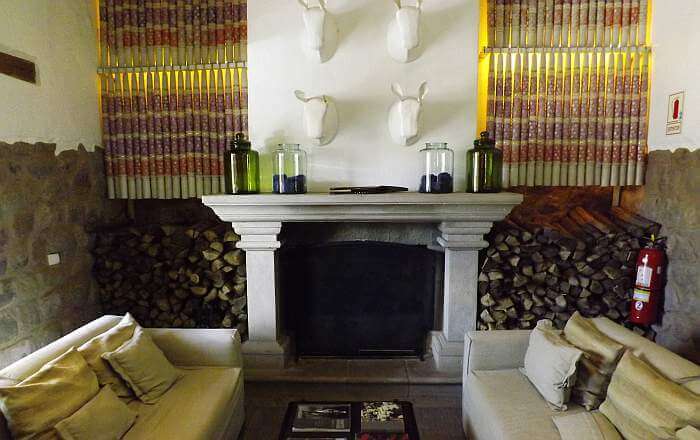 Dotted around the property are elements of this concept, like pillows made from rice sacks and artwork framing the lobby fireplace that’s made from huge church candles. The real manifestation is in the breakfast room, however, where the displays all take on a local commerce theme. There are historic products and ads in glass cases built into the wall and shelves of dried corn and preserved fruits behind the serving stations. 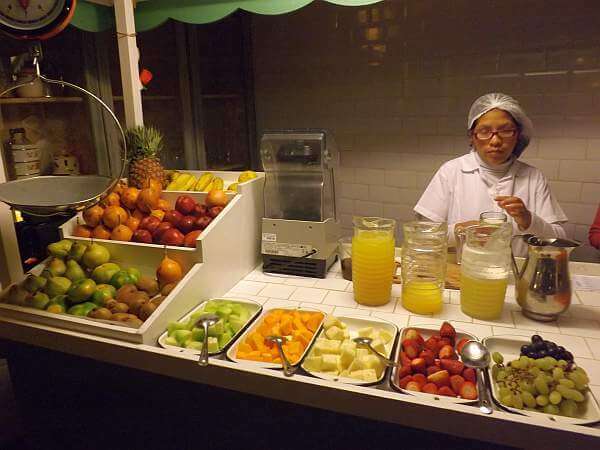 On one side is a juice bar where an attendant will whip up whatever fruit combination you’re in the mood for. On the other side is a another stand proffering “The Nectar of the Incas” herbal concoctions that are supposed to cure what ails you. This included altitude sickness if you haven’t acclimated: you’re sleeping at close to 11,000 feet. Otherwise the breakfast buffet is healthy and varied, with an emphasis on fresh local ingredients and eggs cooked to order. Naturally they’re trying to source the items in this marketplace from the Sacred Valley when possible, with tropical fruits coming in from the lowland regions of Peru. Other meals are served in a more formal, elegant space with rows of white hats like some local women wear arranged behind glass. This extends into the bar area, where you can sip some pisco or a glass of wine. 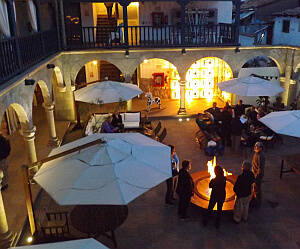 The lobby lounge has a fireplace for chilly nights and guests often gather around a glowing fire pit in the courtyard. Massage treatments are available for those who have sore legs from hiking the Andes and staffers can arrange local tours. Most rooms are urban-sized rather than resort sized, but are efficiently designed and laid out. Comfy beds with comforters are joined by desks with easy outlet access, coffee makers, satellite TVs, and complimentary Wi-fi that works well (by Peruvian standards) on each floor. Rooms stay toastier than most in this city in cold months thanks to the radiant heat system built into the walls. Bathrooms have a separate WC area behind a door and a separate shower room, with good water pressure and fine toiletries. Several larger room classes are available and the top suite has a fireplace and romantic soaking tub in the open room plan. El Mercado Tunqui Hotel is just a five-minute walk from the heart of the historic center in one direction and the current mercado in another. Rates run roughly $160 to $450 depending on room size and season. 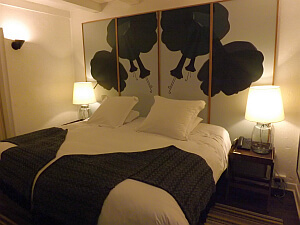 Book your room well in advance as they often get filled up with guests from the parent company’s Lares Adventure tour. Review and photos by Tim Leffel, who was hosted by the hotel while reporting on the Lares Adventure for another publication.